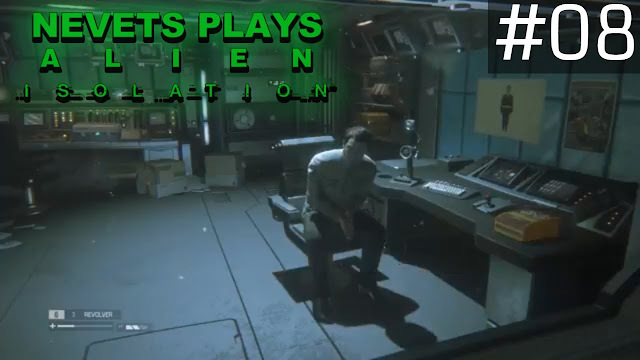 Today on Alien: Isolation, we RE-SNEAK around some of the Working Joes from our last video. This is due to me not saving my progress before quitting last time. I began doing this before recording (so you wouldn’t have to watch this again) but I found a cool hidden Alien film reference on my way to do it. Figured it may be record-worthy. Anywho. This little adventure doesn’t take us too long this time around and we make it back to the transit station. Here is where we have a terrifying and fatal close encounter. Call it a surprise cameo. We next head out to the Scimed Tower where we find Samuels and Nina in a not-so-good state. We’re tasked to find a trauma kit in order to help them out. To do this, we search out San Cristobal Medical Facility. We meet a lazy Dr. Kuhlman who directs us where to go to next. This leads us to a Dr. Morley’s office where we conclude today’s festivities with a breach in our area. (My recording screwed up at the VERY end of this video and I had to improvise a little, in case you’re wondering about anything strange while we’re reading Morley’s computer). Click here to watch on YouTube or check out the video below to watch it from here. ► Playstation 4 built-in recording software. ► Video Type: Full, unedited Let’s Play gameplay with commentary. ► Player REAL Name: It'll come to you.